The Rebel Sweetheart. 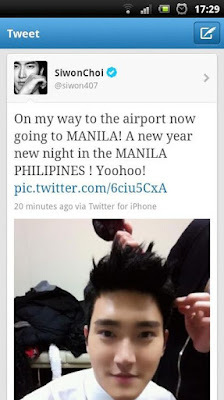 : Siwon: The Super Way to Start the Year! All ELFs (EverLastingFriends of Super Junior, aka their fanclub) went on a frenzy, particularly the PhELFs (Philippine ELFs). Of course, I was one of those frantic fangirls who were wondering what Siwon would be doing here. And at such a short notice! I'm sure my fellow ELFs who are Siwon-biased (me included) nearly fainted upon reading this message. Because I did. The following day, Kyuhyun and Eunhyuk flew in, too. 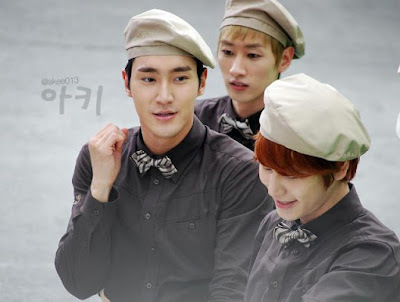 They were joining Siwon in the CF shooting for Kyochon, one of the largest fried chicken restaurants in South Korea. And the location was Eastwood! I swear, if I had been living within that vicinity and if I don't have a son to worry about, I would most likely be one of the screaming fangirls in this photo. 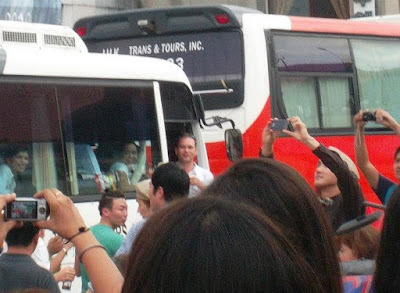 And yes, that's Siwon with his iPhone. Some were even so lucky to get photos of the boys this close. I am so green with envy. But then again, being a Mom comes first before being a fangirl. But if it's any consolation, I finally got these today. Super Show 3 DVD + Photobook. If you can remember, these two items were part of my Holiday wishlist. I can cross them off now. Two down, eight more to go! Haha! Here's how the photobook looks like. I'm afraid this photobook is nothing like the $46.99 SS3 Photobook package. This one has fewer pages and has very minimal text. The more expensive one has 188 pages, and even includes behind the scenes photos plus quips and comments from all ten members. But since I'm more into the DVD, I really don't mind if the boys' names are the only text in this photobook. The paper is nice. Not too thick, but not too flimsy, either. Eat your heart out, Starbucks! The photocards are an extra treat. You get ten one of them, one for each member. Heechul included! No other planner in the world could top this one. Ask any ELF, I'm sure they'll all agree. Thanks to YesAsia and the bonus coupons that they sent, I can stuff Siwon in my bag and take him wherever I go. And I can watch the boys in concert, too - right in the comforts of my living room. Of course, nothing beats watching the real thing. SS4 Manila, fingers crossed. Newsflash: As of this writing, Ms. Happee (the woman who made SS3 Manila possible) has stated that she can't do the same for SS4. It was a decision made by SM Entertainment, the boys' talent agency, record label and producer. So much for my dreams of seeing the Sapphire Blue Sea. Haaay, I wish I could have seen him in the flesh, too! Like you, I would sure be happy to have a diary/planner of a group or actor I'm following, too. I also used to watch Koreanovelas when I was still in the Philippines. Hope to see more happy posts from you in the future! Beautiful planner! And a great shot of it too. So glad you found my link party, Oh Snap!shots of the Week. Looking forward to seeing more of your pictures in the weeks to follow! they are cute but I don't know about them, am sure they are good :-) visiting from happiness is...hope that you can return the visit too.